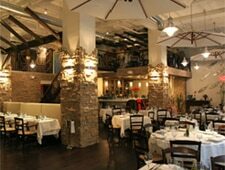 Regional Greek cuisine offering many mezes in Midtown East. : Set on an improbably quiet block across from Grand Central Station, this haute Greek eatery is an ideal blend of contemporary and rustic styles. The interior boasts wood beams compete with industrial tubing while the menu offers Mediterranean dishes that are simplistic yet miles beyond what one might find in, say, Astoria. The kitchen offers a menu that’s rightfully loaded with seafood. Thick and crispy lemon-accented squid --- a finicky dish --- is nicely grilled and not the slightest bit chewy. Grilled octopus works well with a red wine vinaigrette, and there's a rotating selection of fresh whole fish by the pound. 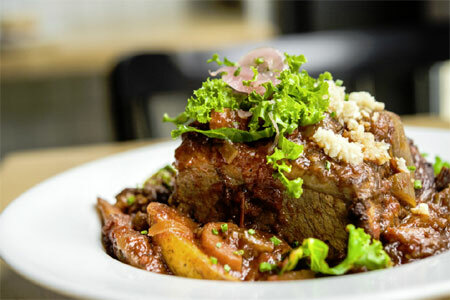 More meaty dishes are available as entrées, including slow-roasted whole piglet and grilled rack of lamb. For dessert, walnut cake is served with cinnamon honey syrup and fig ice cream, and gelato is made in-house. The wine list features bottles exclusively from Greece, like a crisp Chardonnay from Macedonia.